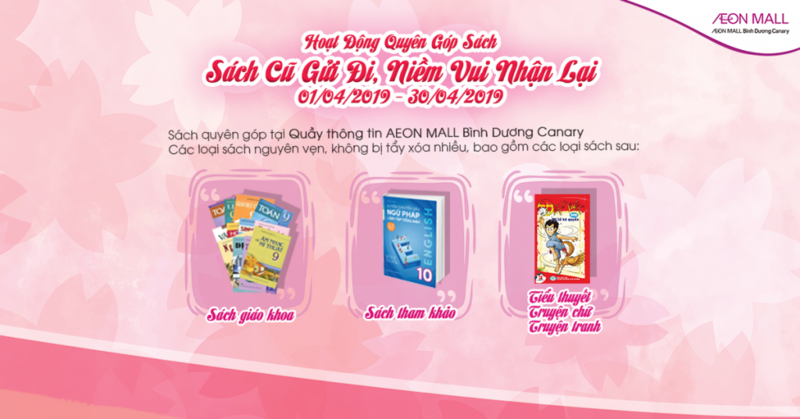 Book donation is one of meaningful activities hold by Aeon Mall Binh Duong Canary and Phuong Nam Book City, aiming to seek for the donations of book to provide the libraries of 4 local schools in Thuan An Town. In collaboration with The Youth Union of Thuan An Town and Phuong Nam book city, AEON Mall Binh Duong Canary has an expectation of contributing to solve the problems about the lack of libraries at government schools in local area. From now on, student would have chances to access to the educational and entertainment resources through libraries. The donated books are planned to be distributed to 4 schools and 4 charity classes located in Lai Thieu, An Phu, Thuan Giao and 2 schools in Thuan An including Vinh Phu and An Son High School. Location: Information Desk at Center Court AEON MALL Binh Duong. Especially, with each 3-book-donated, you will get 01 Phuong Nam book voucher (20.000 VND valued). Let’s join us and share the meaningful activity with AEON MALL Binh Duong Canary.